Map Marketing Mark-it Perpetual Year Planner Laminated PYP Pack of 1 Mark-it Laminated Perpetual Year Planner. Useful reusable calendar/planner supplied complete with a set of self-stick date markers and at year end it takes just seconds to reposition these markers for the next year. Size 600mmx900mm (2FTx3FT). 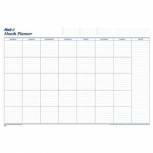 Map Marketing Mark-it Month Planner Laminated MP Pack of 1 Mark-it Month Planner. Keep track of everything that can happen in one month with room for every appointment, holiday deadline, etc. Printed on both sides so you can choose landscape or portrait format. Size 600mmx900mm (2FTx3FT). 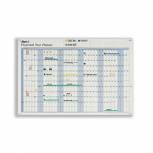 Sasco Magnetic Perpetual Year Planner 2400001 Pack of 1 Sasco Perpetual Year Planner. Versatile year planner which can be used year after year. Printed on metal board and supplied with aluminium tracking for wall mounting and a full planning kit including magnetic shapes, strips, shapes etc. W915xH610mm.